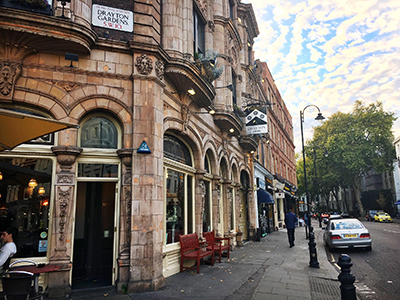 We are genuinely passionate about helping small companies – those just starting out, those who have just formed, those who have big plans – so we do our best to make producing in London as financially viable as possible. We operate on a straight hire basis, with companies taking 100% of the box office. 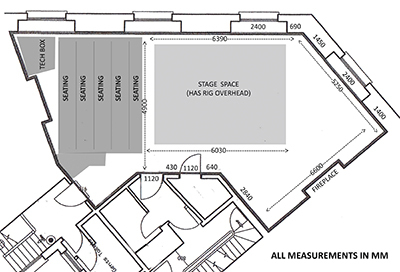 As our little theatre works closely with the pub downstairs, our charges are based on meeting audience minimums. We are able to keep our room hire as low as possible (or nothing at all!) if we have a guaranteed number of people coming in and spending their money on the bar. Hire charges are based on an audience of 18 people. Any fewer and we charge £10 per missing audience member. If you ever feel like you are struggling for numbers, however, we are more than happy to point you in the direction of some papering clubs who may be able to help you fill seats. We do appreciate that 3+ week long runs can be challenging and therefore if an average occupancy of 50% is achieved across the run then we will waive the nightly occupancy charge. We are dedicated to supporting new and emerging companies, first time writers, producers, and directors, as well as creatives just looking to take a risk. As such, we offer Sunday and Monday slots for just £50, with companies taking 100% the box office. Our usual terms apply, with the only difference being a minimum occupancy of 25 people. 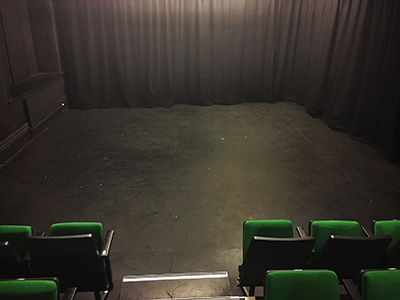 We are specifically looking for companies and creatives that are wanting to grow and develop alongside us – that have long-term plans and a vision for what staging a show here will lead to. We would like the work to be daring, different, and perhaps a little bit out there. We're especially interested in international, devised, and never-before-seen work, and welcome writers and creatives of all backgrounds. Our daytime hire rates vary depending on how many days, the amount of time, and whether you may want a buffet lunch or breakfast, but for single daytime hire we charge between £10-£15/hour, depending on how many hours you use it and whether or not you require the use of our lighting and sound. When you're here, we want you to feel like part of the team! Therefore all of your cast and crew get 50% off one meal a day in the pub during your run, as well as 65p coffees and English Breakfast tea. 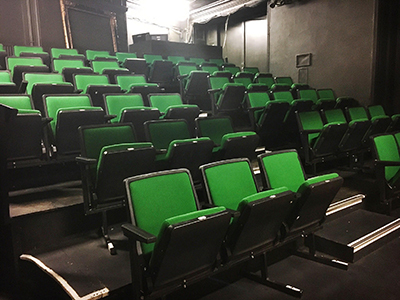 Our fixed raked seating fits 51 people. You will need to pay for one of our approved technicians to set up the rig for you at the start of the show, at a cost of £10/hour, with a minimum call of 3 hours. You will need to provide your own operator during the run (you are welcome to ask if our technicians are available at a rate of £30/show). You will need to provide posters with our marketing guidelines (you may also print fliers but we do not require them). What run length will you consider? What we look for varies based on what we have on, what we've had in the past, and what is topical and relevant. The following is just a general guideline of how we programme – if you have another idea, we'd love to hear it! We are particularly interested in shows with female, BAME, or international writers, and a diverse cast and crew. For shows running a week or less it can be anywhere between 2 and 4 months in advance. For 3+ week long shows we programme a MINIMUM of 6 months in advance. How can I approach you about bringing a show to you? Please fully complete the form below and our Programming Director will be in touch with you within five working days. Companies are expected to market their own productions. We will absolutely do what we can to help, with an online listing, support on Facebook and Twitter, listings on other websites that we have access to, and an e-newsletter that goes out monthly. We are also very happy to advise you on marketing should you ever feel a little lost. You will need to use our chosen ticketing provider, which we will help you set up and all money goes straight into your bank account. We do ask that ticketing fees are inclusive of the ticket price (therefore paid for by your company). All companies are required to use our branding in all advertising, marketing and press releases. Companies are allowed to choose their own ticket prices within our preferred price bands, which tends to range between £5 and £16. Please do not ring the pub or stop in without making an appointment as our team is not always available. I agree to receive the regular production newsletter. Once submitted please await the confirmaion message. Please do not refresh your broswer.